What Bastilla lead teams have you used to beat Traya lead teams? There are a ton of you tube videos of people beating Palp lead teams with Bastilla but that's easy. here’s a little video of my team against traya lead and sith trooper. 100% win rate on offense. Thank you. That's awesome. I was actually considering running that exact team but was unsure how well it would work. I just spent a Zeta on Old Ben's Taunt so I'll have to wait a couple weeks before I can Zeta Nihulus. Do you think this would work alright with Everyone Zeta'd except for Ezra and Nihulus? I was considering running this team with Old Ben in place of Hoda for the TMR. Have you tried that as well? Right now I'm running Bastilla, O.B, GMY, Hoda + Ezra or CLS and I get destroyed by Traya every single time. I'm going to try this tomorrow. The zeta on nihilus and Ezra are not needed at all to beat the traya leads. What made ya go with nihlus over a Jedi tank? Is it bc it wasn't an emp lead? My best guess is because O.B. 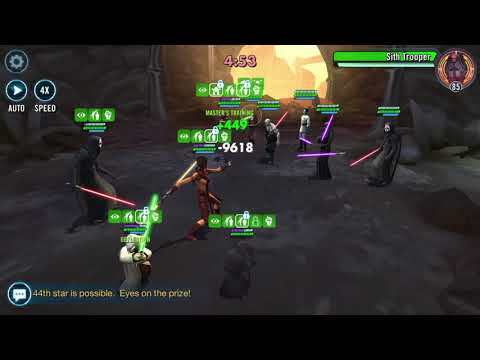 's debuffs don't stick and Nihulus is helpful in getting rid of tanky Sith that are difficult to kill due to the offense down that Traya applies for buff sharing. On top of that he slows down their specials with cooldown increase. Nihilus is there to increase enemy cooldowns, annihilate, and remove Sith Trooper’s buffs. Call Nihilus to assist with Ezra against Sith Trooper, and he’ll also gain 40% turn meter. You can’t get stuck behind Sith Trooper or else you probably won’t win, so you have to keep dispelling his taunt. Any thoughts on most effective kill order?? I just used this team against Traya, Nihilus, Sion, Palpatine, and an underpowered Nest and got massacred. Do you have high powered crit mods or something? My Ezra isn't getting anywhere near that amount of damage and I cant keep my Nihulus alive long enough to get an annihilate. Has anyone succeeded in beating Traya lead teams with Bastila lead on auto? Seeing as how I can auto the Bastila leads on my shard with my Traya lead, I'd say probably not. Traya is just a better defensive option. @Brandakin0187 hey there. Yeah you need his physical damage to be atleast 3k. Then make sure you’ve got an offense or crit damage set on him. He needs that to put out the 50k+ hits. Modding is the key here. Check out my mods. I don’t have crazy insane speed mods but I try and get the right stats. I’ll sacrifice 5 odd speed if the other stats are more powerful. @beasttx1985 I swap in Nihilus only when facing the sith trooper cause there’s a set move that makes it a game changer. You put master’s training on Ezra, have him call Nihilus in to assist and he takes of tAunt on Sith trooper. Then he had TM to use drain force and increase cooldowns. This is then followed by GMY opening a can of whoopA$$ on traya. Now when I’m facing EP lead, even if they have sith trooper, I run GK cause Bastila lead with Jedi can cut down sith trooper real fast if he’s not under traya lead. I can beat some of the Traya / Trooper leads on my shard using the standard five (**** / GMY / HY / Ezra / GK) after I increased the speed on GK to get his group hug off before Traya can isolate him. Haven't tried the DN variant yet - who does Traya isolate and who does Thrawn fracture typically? Seems like it could be an RNG mess - then again, that's Traya for you. It's really random for me who Traya isolates but I kill Thrawn before he even gets a chance to fracture if he's present. With the Old Ben/Nihulus combo I reduce turn meter then increase cooldowns before they get a turn so I don't have to deal with their specials until their second turn. My standard Bastilla, GMY, Hoda, Ezra, and Old Ben get massacred my Traya teams though. By the time I get to Nihulus with that team his health is so ridiculously high that I can't kill him within the alotted amount of time. Not to mention a lot of times I'm dead before I get to him. My kill order with the other team though has been Thrawn, Traya, Palpatine, Sion, Nihulus. I save Nihulus and Sion for last because they are such hard kills. I can actually beat the non-Trooper Traya leads with the standard Jedi. Getting off of that taunt from Trooper, in conjunction with his armor/defense can be infuriating. I'm a little afraid of what improved defensive mods are going to do to that team (and if it means it's finally time to bit the bullet on ATF's whirlwind zeta?). I've been contemplating using ATF but Nihulus has been my saving grace for those hard to kill toons. The few times I tried to use ATF she just didn't hold up long enough to get me a win and her attacks were weakened by Trayas lead ability. Has anyone succeeded in beating Traya Sion DN ST + Dooku by Bastila without DN or Thrawn? Can "Bastilla Jedi Jedi Thrawn/Jedi & DN" bet those teams (attacking toons are slower then enemy Thrawn/Nest)? There's a nest with 140 speed from mods on one traya lead team. I can beat them. The super fast thrawns come down to rng for me. Does he swap tm with sion first and i can keep going? Does he fracture? If he fractures nihilus it's fairly hard to recover.